Philip Wilcher writes: Sadly, this unique landmark will soon be no more. Plans are to demolish this building by the end of 2020 in order to make way for the widening of Highway 441. Bluewater was founded in 1838, and the congregation first met in a log structure near the banks of Bluewater Creek, which I don’t know the location of. 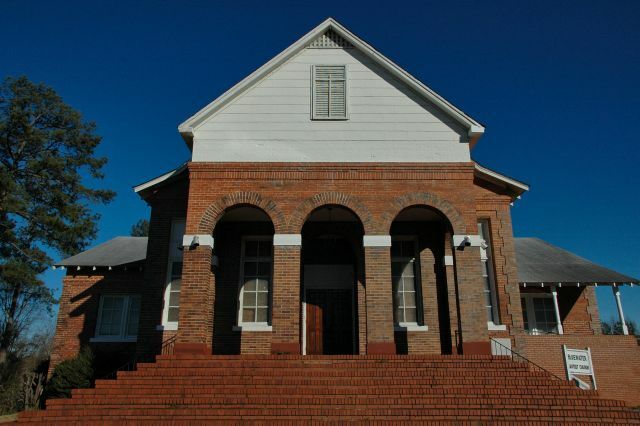 The church’s second building was built in 1881, a wooden structure that was located across the road from the current building in the vicinity of the church cemetery. The church has been meeting in the current building since 1922. The new building will be located across the road, just south of the church cemetery. I am a member of this church. Sadly, this unique landmark will soon be no more. Plans are to demolish this building by the end of 2020 in order to make way for the widening of Highway 441. Bluewater was founded in 1838, and the congregation first met in a log structure near the banks of Bluewater Creek, which I don’t know the location of. The church’s second building was built in 1881, a wooden structure that was located across the road from the current building in the vicinity of the church cemetery. The church has been meeting in the current building since 1922. The new building will be located across the road, just south of the church cemetery.